For all intents and purposes, it had been a relatively "normal" Tesla conference call. 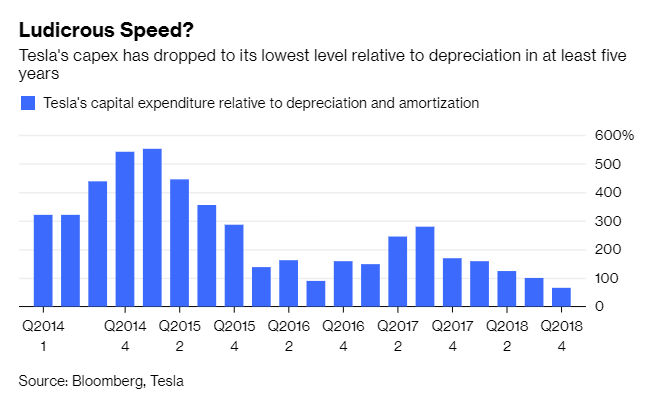 There were no "boring, bonehead" questions; Bloomberg's real time commentary even said "Besides a loud Elon Musk cackle, this may be the most ho-hum Tesla investor call in ages." ...but by Tesla standards, the call actually went relatively normally. Even Elon Musk, inbetween stuttering and lobbing sophisticated sounding guesses at questions from analysts, for the most part stayed on script. He refrained from calling analysts "boneheads", he didn't say "Let's go to YouTube" and did not appear to be using drugs or under the influence. But then, literally in the last minutes of the call when everybody thought that the quarter was going to come and go without any shockers the call turned back to Musk who, in Steve Jobs fashion, had to announce just "one more thing." Only unlike Jobs, the announcement wasn't good news. After all questions had been taken and most analyst lines disconnected, Musk matter-of-factly announced that the $60 billion company's CFO, Deepak Ahuja, was quitting... for the second and final time. Not only did the announcement stun everybody - at least those who were still connected – it was not included anywhere in the shareholder letter or mentioned previously during the call which ended roughly a few minutes after the announcement. Tesla executives signed off by saying they'd speak to investors in three months, as if the idea of boring, bonehead follow-up questions from the announcement was beyond comprehension. What made the announcement even more bizarre, is that it was Ahuja's second term as CFO, and many of the people reporting directly to him have since resigned or otherwise left the company over the last couple of years. Tesla announced that the CFO's replacement was "Zach", who was identified only by his first name at initially Elon couldn't remember his last name. He was later revealed to be 31-year-old Zachary Kirkhorn, a senior finance analyst at the company. Naturally, this provoked bemused reactions on Twitter and everywhere else. "Zach's" credentials were immediately called into question. Others seemed to take slight exception with how the news was released. Even the mainstream press couldn't help but be skeptical. Forbes contributor Jim Collins called the departure of Ahuja "a huge negative". Bloomberg called his departure at this point during Tesla's global expansion "truly astounding", and the market agreed, slamming the stock to session lows after the surreal announcement. But not everyone was negative. Who needs experience when you can have a "great" young guy at the helm, a prominent Tesla bull argued. This wasn’t the first time Ahuja stole the show during the conference call. Earlier in the call, when asked by an analysts about the number of reservations that the company still had yet to fulfill, Ahuja replied that reservations were "irrelevant". This also inspired shock amid the investing public. Later, The Wall Street Journal's Charley Grant was first to point out that the reservations were so irrelevant, they made their way onto the front page of a $1.8 billion equity raise prospectus back in 2016. "reservations are not relevant for us." Deepak. Says it's not appropriate to share count. REMINDER: reservation count was on page 1 of a $1.8 billion equity offering prospectus back in 2016. The Ahuja news firmly replaced what had been the obvious candidate for most ridiculous thing said on a conference call, when earlier in the call CEO Musk claimed that the Model 3 had "insanely high" demand, but that this demand was being inhibited by people's ability to pay for the car. If only demand could be measured by people who merely "want" things, without being actually required to pay for them. As one would expect, Tesla stock which was down about 2% heading into the call, finished the after hours session down about 4%, tumbling on the literally last minute news. In short, brace for another rollercoaster year for the company which has now seen the departure of about 40 senior level professionals in the past 2 year, and whose CEO was so busy when drafting the stream of consciousness essay that passes for a Tesla earnings report, that he totally forgot to announce that the company's 2nd in command was retiring.